Our patient wanted a new nose which was better than her old nose before she injured and broke it a few years before. 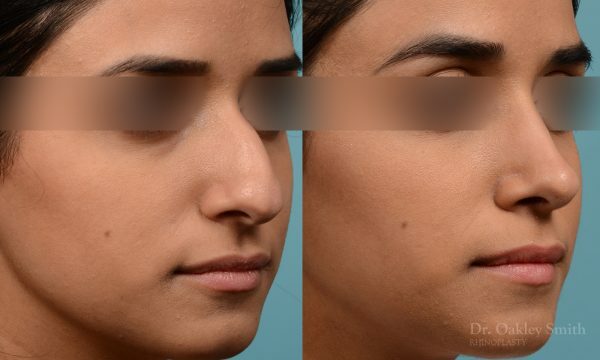 The injury had caused her nose to become crooked while she wanted the original bump replaced with a gentle curved profile, her nose smaller so as to fix her face more harmoniously, her nasal tip rotated slightly, and eliminate the “V” created by her strong tip cartilages. An external approach was used. Dr Oakley Smith performs almost all his rhinoplasties using the ‘open’ approach. 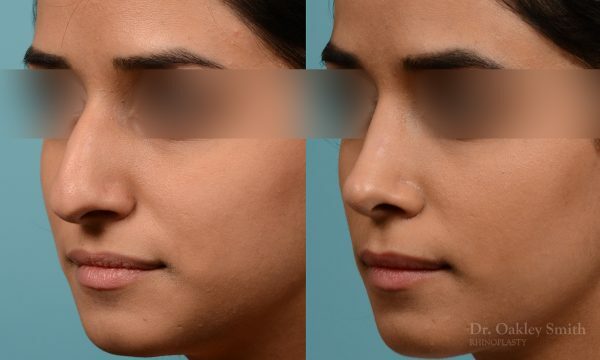 He feels the creation of a small scar under the nose is justified by the increase in surgical exposure and ease of performing the technical manoeuvres. Her scar is typical. It can be seen if looked for, but is not noticeable. 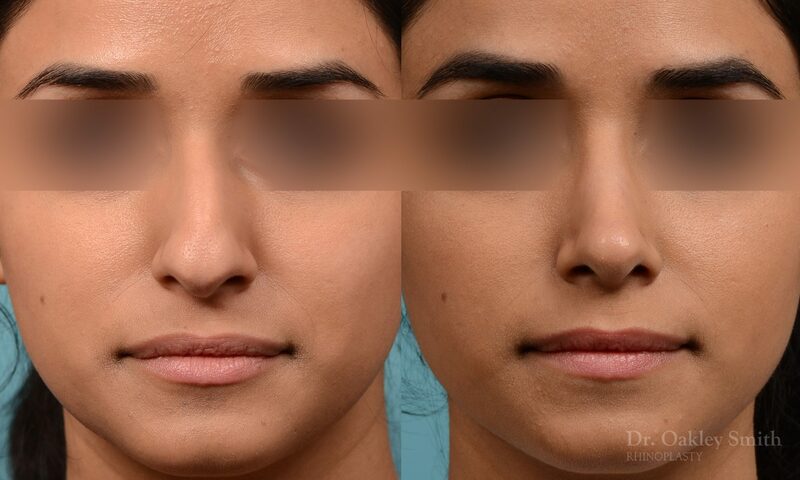 The three thin sutures are removed a few days after surgery and should not be absorbable as this increases the inflammatory response and the possibility of “train tracking’ scarring. 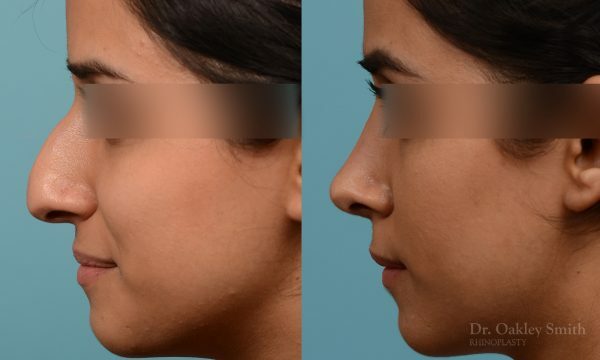 Her nasal anatomy permitted a reduction in the overall size of the nose of four millimeters measured from her tip. 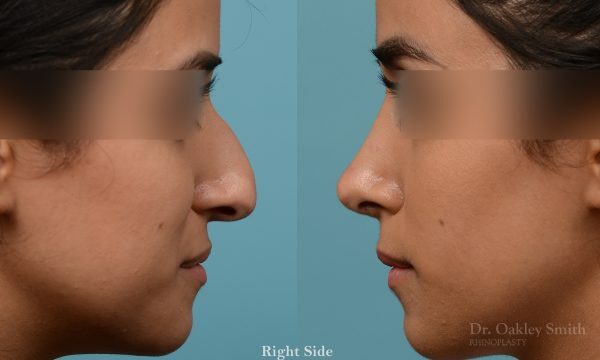 To be able to maintain tip asymmetry with this degree of moderate reduction, in Dr Oakley Smith’s opinion due to the external approach. 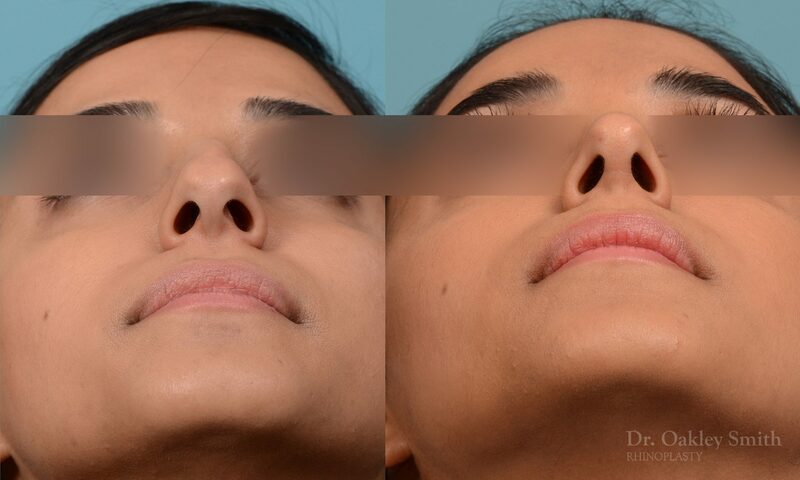 He would like to again thank his patients for allowing their cosmetic rhinoplasty before and after photos to be viewed by the public.